Despite scientific advances in the development of antimicrobials, tuberculosis continues to be the leading cause of death by infectious disease in the world. World Tuberculosis Day is celebrated on March 24 and aims at raising awareness on the disease’s devastating health, social and economic consequences, as well as to increase efforts in fighting the global tuberculosis epidemic. World Water Day was established by the United Nations Conference on Environment and Development in 1993 and, since then, it has been celebrated annually on March 22nd, with the general objective of approaching topics related to clean water supply issues; raising public awareness on the importance of conserving, preserving and protecting water, water sources and clean water supplies; and raising awareness among governments, international agencies, non-governmental organizations and the private sector for achieving these objectives. 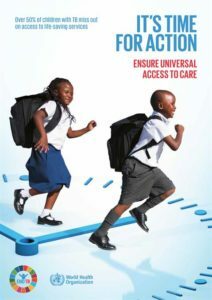 In 2019, the motto of the campaign is “Leaving No One Behind”, an adaptation of the central theme of the 2030 Agenda for Sustainable Development: as sustainable development progresses, everyone must benefit. Access to water is the foundation of public health and, as such, essential for sustainable development and for a prosperous world. It is not possible to advance as a global society while many people live without access to clean water. For this reason, one of the Sustainable Development Goals (SDG6) refers to Clean Water and Sanitation: “Ensure access to water and sanitation for all”. By definition, this means leaving no one behind. Currently, this basic right is not part of the daily life of billions of people around the world who live without water in their homes, workplaces, schools, plant nurseries and factories, and fight to survive and progress. Marginalized populations such as women, children, refugees, indigenous populations and people with special needs suffer with discrimination, as well. 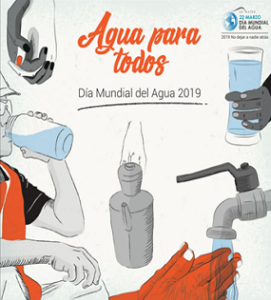 Factors like environmental degradation, climate change, population growth, conflicts, forced displacement and migration also aggravate the problem, affecting marginalized populations disproportionately regarding access to drinkable water. The campaign “Leaving no One Behind” focuses efforts on the inclusion of marginalized or ignored people. Services for supplying water must be extended to these populations and their opinions must be heard in decision-making processes. The regulation and legal frameworks must recognize the right to quality water for all, and necessary and sufficient financing must be effectively directed to vulnerable populations. Rich countries pay less for higher quality water than poor countries pay for inferior quality water. March 24th marks the day in 1882 when Robert Koch announced in Berlin the discovery of the causing agent of tuberculosis, Mycobacterium tuberculosis, better known as the TB bacillus or Koch bacillus. This discovery allowed for unprecedented advances towards the diagnosis and cure of the disease. One hundred years after the announcement, the date was also adopted by the World Health Organization for one of the Organization’s eight global health campaigns. The date is celebrated every year to raise awareness on the devastating health, social and economic consequences of tuberculosis (TB), and to increase efforts for fighting the global TB epidemic. Despite scientific advances in the development of antimicrobials, TB continues to be the leading cause of death by infectious disease in the world, being responsible for the death of 4,500 people every year and 30,000 new cases. Global efforts to fight the disease, however, have saved 54 million lives since year 2000 and have reduced mortality by 42%. In 2017, the WHO estimated 282 thousand new cases of tuberculosis in the Americas, 11% of which were people living with HIV. Ten countries represent 87% of cases; Brazil, Colombia, Haiti, Mexico and Peru report two-thirds of total cases and deaths. It is estimated that 24,000 died in 2017 due to tuberculosis in the Region, 6,000 of which were co-infected with HIV, according to a PAHO report published in September 2018. The theme of this year’s campaign for World Tuberculosis Day is “It’s time for action. End TB”, aiming to recall that the fulfillment of commitments agreed upon by chiefs of State must be accelerated. In September 2018, during the first High Level Meeting of the General Assembly of the United Nations on tuberculosis, world leaders agreed to advance daring goals and urgent measures to bring an end to the disease. BIREME has selected official PAHO/WHO documents besides other that have been included in the Virtual Health Library on the themes of the campaign for World Tuberculosis Day 2019, available on the Knowledge Showcase dedicated to the topic: https://bvsalud.org/en/post_vitrines/world-tuberculosis-day-its-time-for-action-end-tb/. The others are: World Health Day, Blood Donor Day, Vaccination Week, World Malaria Day, World Day Against Tobacco, World Hepatitis Day and World AIDS Day.